A former North Belfast Catholic schoolgirl who travels to England to take part in mass anti-Muslim marches organised by the extreme right wing group the English Defence League (EDL) has been exposed by her former fiancé. Margaret Brophy, who attended Little Flower Girls’ school and who lives in the Cliftonville area, regularly travels to England to take part in the often hate-filled marches and has even been pictured stewarding an event in Bristol. A Facebook profile under the name Margaret Boomer Brophy has also come under the attention of a number of websites aimed at identifying members of the anti-Muslim group. Vile racist ‘jokes’ posted on Brophy’s Facebook refer to Islam as Pisslam with the rest of the content being too offensive to reprint. On some of the sites, the 49-year-old mother and carer is branded as the “Irish Angel” – Angels being the name of the women’s wing of the group – and numerous racist posts and insults made under her name are shown. Her former fiancé David Ewing said he wanted to highlight his ex-partner’s involvement with the group to the unsuspecting North Belfast community where she lives and works. An Israeli spokesman has confirmed that offensive images featuring European national icons were sent from his embassy’s official social media accounts. Dublin was not the only city to come into the Israeli propaganda sights. A montage of pictures also showed the Mona Lisa in Paris wearing a niqab and carrying a rocket launcher. Michaelangelo’s David was shown in Arab headgear and wired up as a suicide bomber with a warning to Italy, while Copenhagen’s Little Mermaid was shown holding a gun. 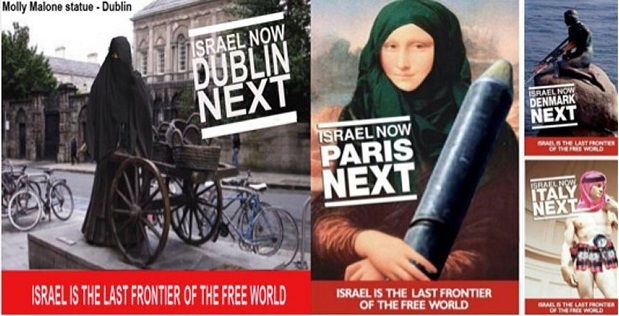 The Israel In Ireland Facebook and Twitter accounts have been blasted for sharing the series of controversial posts. But disgusted online viewers called on the Government to take decisive action. 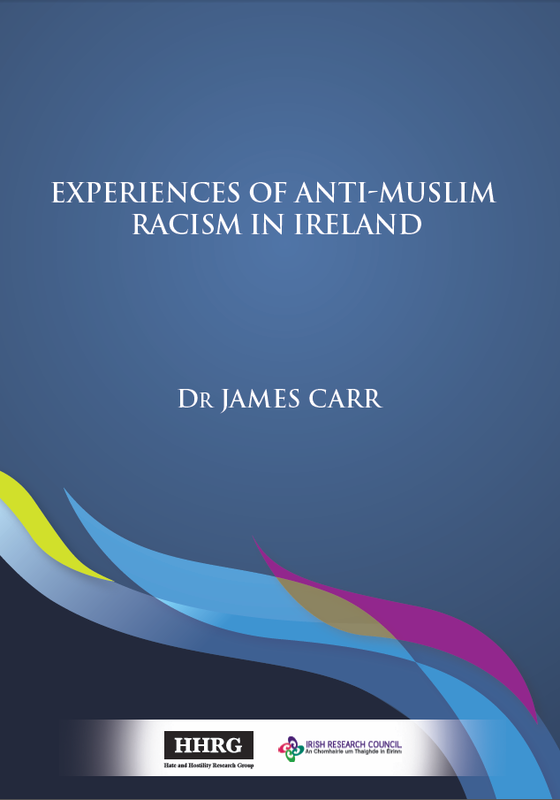 An informative report by Dr James Carr on racism and bigotry against Muslims in Ireland has been published by the University of Limerick. Based on a survey of Irish Muslims on their experiences of anti-Muslim hostility, complemented by one-to-one interviews and focus group discussions, the report found that 36% of respondents felt they had been targeted on the basis of being identified as Muslim. The survey found that women, who were more easily identified as Muslim because of their dress, experienced higher levels of anti-Muslim hostility (44%) and discrimination (40%) than men (28% and 22% respectively). Women interviewees also reported their frustration at being subjected to anti-Muslim stereotyping and regarded condescendingly as passive victims of male oppression. 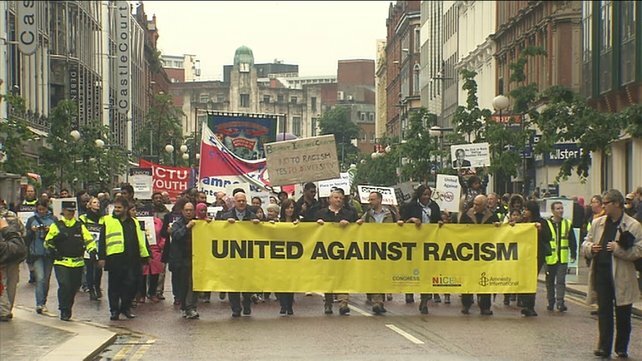 Thousands of people have taken part in an anti-racism march in Belfast. Organisers said it was designed to “reassure ethnic and religious minorities in Northern Ireland”. Representatives of the Muslim community and trade unions were among those who spoke at a rally ahead of a march from Writers’ Square to Belfast City Hall. 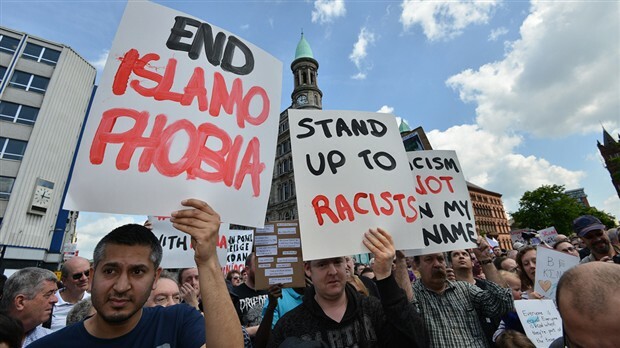 It was organised in response to an upsurge in hate crime and controversial remarks about Islam by a pastor and First Minister Peter Robinson. Pastor James McConnell made a public apology on Friday for calling Islam “heathen” and “satanic”. Saturday’s march was led by Belfast’s Lord Mayor, Nichola Mallon, Dr Donald Watts, president of the Irish Council of Churches and Dr Mazhar M Khan, a member of Northern Ireland’s Muslim community. Amnesty International, the Northern Ireland Committee of the Irish Congress of Trade Unions (NIC-ICTU) and the Northern Ireland Council for Ethnic Minorities (NICEM) organised the event. First Minister Peter Robinson has publicly apologised for offence caused to Muslims following comments he made in defence of a firebrand pastor who denounced Islam as “satanic”. Speaking outside the Islamic Centre in Belfast following a meeting with Muslim leaders, Mr Robinson said he had made a “face-to-face, man-to-man” apology. Last week the DUP leader came under fire for defending the Pastor James McConnell’s remarks, telling the Irish News he would not trust Muslims involved in violence or those devoted to sharia law, which covers everything from public executions to what adherents should do if colleagues invite them to the pub after work or college. Mr Robinson said he would “trust them to go to the shops” for him. He later clarified his own remarks and met Muslim leaders in Belfast to apologise privately. But despite offering a public apology to Muslims, this evening Mr Robinson fell short of condemning comments made by Pastor McConnell during a sermon last month. After addressing the waiting media, one man – who had earlier visited the Islamic Centre – brought up the issue of Mr Robinson’s defence of the controversial pastor’s remarks. A Pakistani man has vowed to flee Northern Ireland after he and a friend were injured in two racially motivated attacks – carried out within a matter of hours. 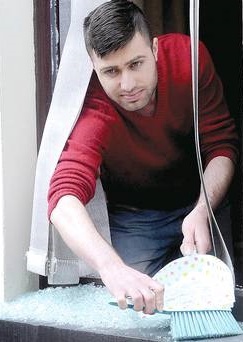 Less than 24 hours after attending an anti-racism rally in Belfast, friends Muhammad Khattak and Haroon Khan were assaulted and had their north Belfast home set upon by thugs yesterday. In an interview with the Belfast Telegraph, Mr Khattak blamed the atmosphere stirred up by the fallout of an anti-Islamic sermon given by Pastor James McConnell, who was later backed by First Minister Peter Robinson. In the six months since they moved into their home in Parkmount Street in the north of the city, they said they have suffered constant racial abuse. 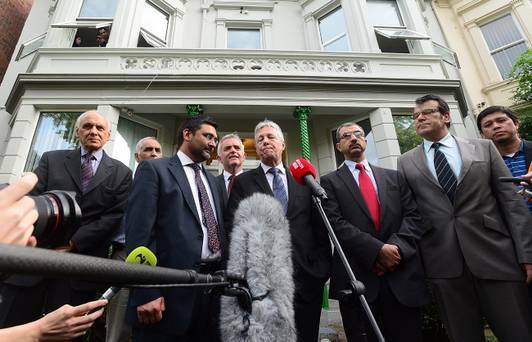 Mr Khattak (24) said Peter Robinson’s remarks about not trusting Muslim terrorists “cast suspicion over every Muslim”. And he said the controversial words of Pastor McConnell gave his attackers “the licence” to do what they did. “They have lit the fire in the forest and it is not going to stop,” he told the Belfast Telegraph. One of the speakers at an anti-racism rally attended by thousands of people in Belfast on Saturday has called for the First Minister to make a public apology over recent comments he made about the Islamic faith. Mohammed Samaana has worked as a staff nurse at the Ulster Hospital for over a decade. A member of the Muslim community, he has been the victim of racist attacks in Northern Ireland. He told UTV that the First Minister Peter Robinson should apologise publicly for recent controversial comments he made about Muslims. The DUP leader’s comments appeared to defend controversial evangelical pastor James McConnell, whose sermon about Islam is being investigated by police. Mr Robinson has previously insisted his remarks were “misinterpreted and given a meaning that was never intended”. He met with NI’s Muslim leaders earlier this week at Stormont Castle, where he apologised in private. Mr Samaana said the apology should not have been behind closed doors and he is angry that the First Minister has not apologised to all Muslims. “I heard the insult – but I haven’t heard the apology. I heard that he apologised before three men behind closed doors – that’s not an apology, ” he said. 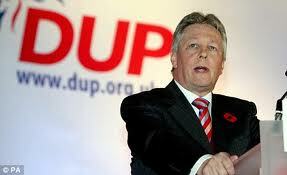 He wants a public apology and for Peter Robinson to condemn the recent negative comments made by Pastor McConnell. First Minister Peter Robinson has defended the evangelical pastor who is at the centre of a police investigation into a sermon which has been accused of amounting to a hate crime against Muslims. Pastor James McConnell sparked controversy when he likened “cells” of Muslims in Britain to the IRA and told his congregation that Islam was a “heathen” doctrine which had been “spawned in hell”. The preacher, from the Whitewell Metropolitan Tabernacle on the Shore Road in north Belfast, has already told UTV that he stands by his comments and has rebuffed calls for an apology. Representatives of the Muslim community in Northern Ireland have expressed shock. Mr Robinson said he did not trust Muslims who were involved in “terrorist activities” or those “fully devoted to Sharia law”. According to the First Minister, not trusting someone does not amount to hate crime, using an example of the media not trusting politicians. The moderator of the Presbyterian Church has criticised remarks made by Pastor James McConnell who described Islam as “heathen” and “satanic” in a sermon. Pastor McConnell, of north Belfast’s Whitewell Metropolitan Tabernacle Church, made the comments last Sunday. Police have said they are investigating Pastor McConnell’s comments. He told his congregation “a new evil had arisen” and “there are cells of Muslims right throughout Britain”.